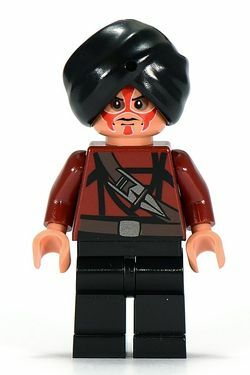 The Thuggee Guard was a minifigure released in 2009. The Thuggee guard wears a black turban, has a dark red torso, and completely black pants. His face depicts a stern expression, covered in red face paint. The Thuggee Guard was a member of the Thuggee Cult, a secret religious society centered in India. Members worshiped the goddess Kali Ma with barbaric human sacrifices. They are enemies of Indiana Jones. They appear in 7199 The Temple of Doom in a mine cart. This page was last edited on 10 January 2016, at 00:50.